Grapevine communication - What is it and why should we avoid it ? This was the topic discussed yesterday during one of the sessions of Spiritual Awakening in our office. One of the lady with very impressive credentials in psychology demonstrated a very powerful value based activity to help us ingest some of the beautiful lessons of life. Let me first share the activity. She called the 5 volunteers and then asked 4 of them to go out of the room. Now, she explained a scenario and asked the volunteer to enact that scenario. The scenario was that you went to supermarket, take the trolley and then you purchase the 1st item on your way, rejecting 2nd item and then again selecting 3rd item and at the end do a payment and came out. After explaining the scenario, she called the one of the volunteer from outside and told him to observe and then repeat the same actions of the volunteer. After this situation was put into action by 1st volunteer, she called the third volunteer from out and asked him to observe and then repeat the action of the 2nd volunteer. This activity continued till the performance of last volunteer. And then she asked the volunteers in the reverse fashion that what they think they were doing. The message was distorted completely. May be by now, you have understood the significance of the activity. If not, stay tuned. Last volunteer told us that he thought he was putting the garland around some big personalities and at the end, put the remaining garlands in basket. Second last volunteer told us that he thought he was collecting books from different shelves and then putting it in a school bag. Another one thought he was in a book store. The next one told us the right answer that he is in a supermarket and doing shopping but added so much masala/material by himself. He purchased too many items and thus did not follow his predecessor properly. By the time, massage crosses 3, 4 ears, it had completely lost its meaning. Yes, every one of us perceives the given situations as per his fears; mentality and they needn’t to be necessarily true. Thus, we cannot always believe on our eyes and also the information from the second hand source because that source perceives it as per his mentality which may not be true. 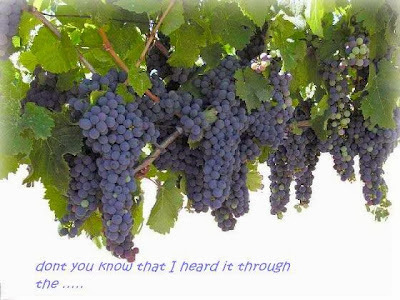 In terms of management and corporate, grapevine is a term for this type of communication. We must avoid such communications/gossips not only for saving ourselves from landing in trouble but also in order to build trust and reputation.